Show your fun side with this cube of choc beans. 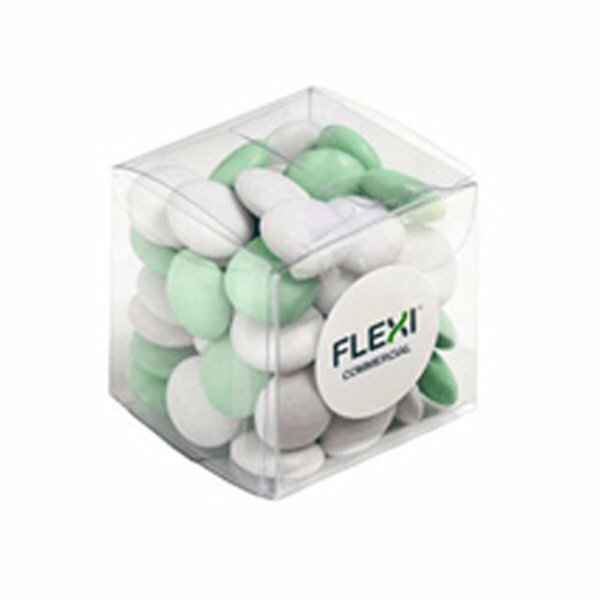 Make the promotional Choc Beans Small Cube stand out with your logo. Promotional events always pump up the excitement. And if you want more excitement out of your next events, then you’ll need something that’s just fun and exhilarating. So we’d like to bring you the branded Choc Beans Small Cube. The custom Choc Beans Small Cube is a great marketing ally if you really want to make a very memorable experience for your colleagues. It may come as a simple package, but the chocolate treats inside are truly extraordinary. It’s 40mm in width and 40mm in height. With 60 grams of colourful candies displayed inside its see-through body, the personalised Choc Beans Small Cube is very visually alluring. It’s easy for this product to catch attention as it just begs to be tasted. And when it’s been tasted, it’s hard for a cube to remain completely unfinished even in just five minutes. Now for advertising your branding, we’ve allotted a 20mm diameter sticker for your corporate design. Your corporate design can be your logo or any trademark that you’d like to use to advertise your company. It will be printed in full colour and will be displayed right at the front. Your corporate design on the customised Choc Beans Small Cube will surely take your brand a notch higher with every event. We do also have a good line of pralines that you can use as a promotional gift also. Do take a look at the promotional Cappuccino Large Pralines if you like your pralines with a hint of coffee. Or if you like butterscotch with your pralines, the decorated Butterscotch Cup Pralines is a sure winner. Might as well add some printed standard balloons to spice up your events. We have a lot of these promotional balloons you can also look into. Let us know how we can help you. Talk to us online through live chat or dial our hotline 1300 008 300, and a customer service staff member should be able to help you out.